1 bedroom loft with gorgeous waterfront views. 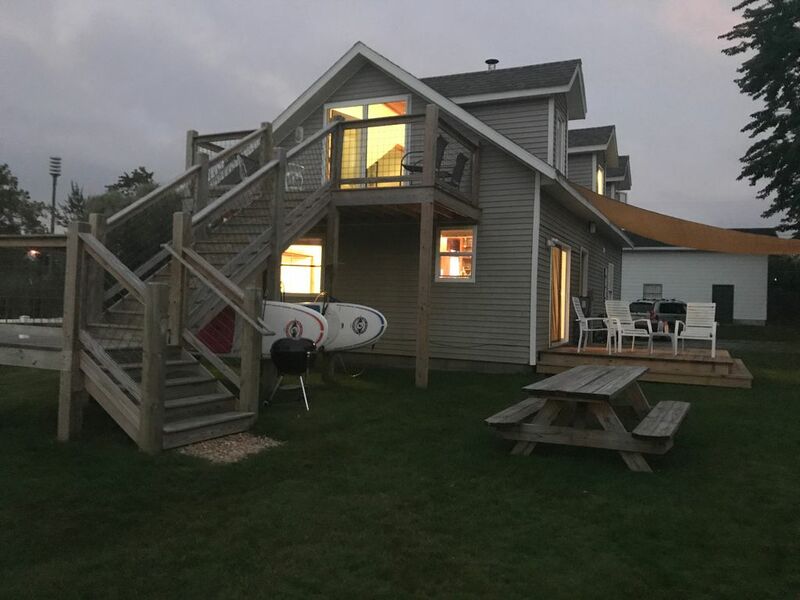 Contemporary one bedroom loft with waterfront deck overlooking the Narrows Passage in Leelanau County. The loft comes with accommodations for up to four people. One bedroom, plus a pull out couch. Full European kitchen with all the amenities. Waterfront property with deck overlooking river that connects North and South Lake Leelanau. Boat slips, pontoons, fishing boat, kayaks, stand up paddle boards, fishing gear all available to rent. Walking distance to local grocery, restaurants, bars, wine tasting rooms and Northern Lights Distillery. Walking distance to everything; grocery, winery, distillery, fishing, church and shopping. Boat slips, pontoon boats, kayaks, SUPs a fishing boat, ski boat and marine gas available. Small, contemporary, European style kitchen. Huge lawn for games, entertaining, etc. Right on the water. Large stairs to 2nd story deck with front door access. Great location for everything in the area. Wish we could have brought our boat..
Would highly recommend renting a pontoon and spending the day on the water..
We loved our stay - location was central to a ton of activities, great view from the top deck, the place was very clean, staff (Ben and Hilary) were very helpful and friendly, and having access kayaks and stand up paddle boards was a bonus. We'd definitely recommend it. It was a nice, clean place in a central location - explored Sutton's Bay, Glen Arbor and the Dune, Empire, Lighthouse area and Leland. Lake Leelanau's local bar, coffee shop, breakfast/lunch restaurant were all good!! Boathouse Winery was fabulous. Only talked with Hillary once - nice guy, and he was very quick to respond to email. We would stay here again! Very comfortable loft with friendly staff- in a good location and nice view of the sunsets. We loved our stay here. Your space was amazingly perfect for my husband and I. We are looking forward to staying here again in the future. We loved this place! The loft is one of three places that is available to rent at this great little “yacht club” along a straight between two lakes. It felt like our own little private resort. The uniqueness of the place really added to our few days in this part of Michigan. The place is super clean, has everything you need (only missing an oven in the kitchenette area), lots of room to gather, and a fabulous view. We never got around to using the fire pit, or renting a pontoon boat at a reduced rate (the guest rate), but we certainly enjoyed the canoe and kayaks. We were just very happy to have chosen this place which had more character than any house we may have rented, and was walking distance to a couple very good restaurants and a wine tasking room along the water. Perfect base of operations for all of Leelanau County.